3Mâ„¢ Cubitronâ„¢ II Rolocâ„¢ Durable Edge Disc 984F offers a superior solution for tackling medium to high pressure grinding applications when a smaller-sized disc is needed. It excels in stainless steel, cobalt chrome, and nickel alloy applications. 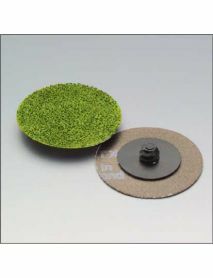 Use 3Mâ„¢ Cubitronâ„¢ II Rolocâ„¢ Durable Edge Disc 984F for an exceptionally high cut rate with a long disc life. Our discs use a laminated 2-ply polyester backing for durability and wear resistance in edge work. 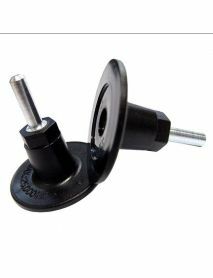 The incorporated grinding aid makes this an outstanding product for all types of metals. This keeps the disc cooler on stainless steel and heat-sensitive metals such as nickel alloys and titanium, reducing metal discoloration/oxidation and the chance of heat-related stress cracks. These discs feature 3M Precision Shaped Grain which forms into triangular points that slice through metal rather than gouging or ploughing like traditional abrasives. The points continuously self-sharpen as they fracture, generating an extremely fast cut. This allows operators to finish tough tasks with less fatigue.